Manufactured right here in the USA, Electra-Lock is a revolutionary fencing system designed to improve livestock containment at a fraction of the cost of traditional fencing methods. Available in four or five strands of hi-tensile, class 3 galvanized wire set on 10" spacing with a vertical stay spaced every 24". Vertical stay locks tight against horizontal strands with a specially designed lock knot to hold it in place. Has the strength of 12.5 gauge hi-tensile wire. 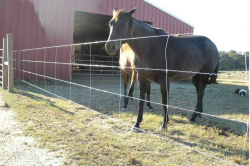 Provides a greater visual barrier for livestock than a standard four wire fence. Perfect for cattle, horses, and a variety of other livestock. The most cost effective and innovative product on the market. This fencing can be installed with any manufacturer's fence chargers, steel T-posts, fiberglass post, insulators and strainers. If power is lost to your energizer, you still have a substantial perimeter fence.